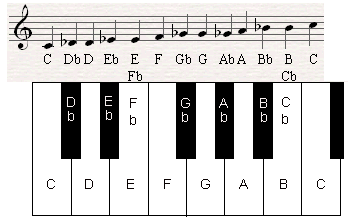 Until today we have been playing only with the white keys, but if you have played a few songs in different places on the piano by ear (As I suggested to do here ) you probably realized that when you do that you also have to press the black keys in order to get the melody right. Later on we will discuss about why this happens but first let's name the black keys. This is the sharp sign. When you see a sharp sign next to a note it means we have to play the next keys to the right whether it's a black key or a white key. In this picture all the Sharps are notated and shown in a logical order. This is the flat sign. 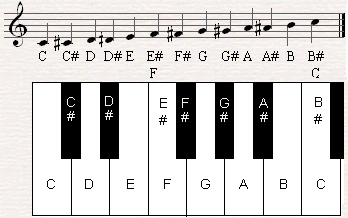 If you see a flat sign before a note it means you have to play the next key to the LEFT, and again it doesn't matter whether it's a black key or a white one. Now let's play a few pieces with sharps and flats. In the next piano lesson I'll show you some importnat music accent marks. It will enrich your music articulation. Return from Order of Sharps and Flats on the Piano Keyboard to Piano Notes.